One of my favorite cafes in North Beach is Mario’s. In 1987, before my husband, Michael, and I moved to San Francisco, we visited his sister, Ravenna, and her husband, Chuck. 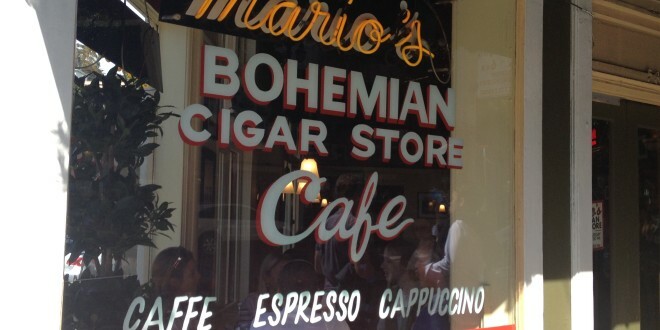 Ravenna took me to North Beach to a place called Mario’s Bohemian Cigar Store for lunch. The cigars are no longer there but the café, a long time favorite of mine, still is. At that time, I would have ordered a meatball sandwich (before I swore off beef) and a glass of their house red. The meatballs and sauce reminded me of my mom’s homemade version. Now, it’s the fried eggplant sandwich and a cappuccino that I order, equally as delicious. Their cappuccino is one of the best, if not the best, in the city, and I’ve tasted a few. One day I asked the owner which coffee they used and she told me they bought their coffee beans from Graffeo’s down the street. After that, Graffeo has been my coffee of choice, although I haven’t quite mastered the Mario’s touch for making cappuccino. Ever since that first visit, I have been coming back to Mario’s so regularly that they occasionally recognize me. After taking clients to Star’s (where I was not recognized) for dinner back in the day, I took them to Mario’s for a drink afterwards and as I walked in the door, the owners quickly acknowledged me, much to my clients’ amusement. Over the years, I have met interesting people there, like the older Italian woman from the neighborhood who delighted in telling me about the history of North Beach. I have enjoyed bringing friends and family to this special place. If you are lucky, you can get a seat by one of the windows which looks out at Washington Square Park and the magnificent Church of St. Peter and Paul. It was on these church steps that Marilyn Monroe and Joe DiMaggio were famously photographed after their civil ceremony since they couldn’t get married within because Joe DiMaggio had divorced his first wife. While some things have changed in North Beach, Mario’s, except for a few minor renovations, remains the same, continuing to serve the same good food and drink, attracting locals and tourists alike. Previous: Special SF Spots – It’s Not Just About Real Estate! Next: San Francisco Gets Even Wackier – Baaah, Here Comes Prop G!